Ajemex (Mexico) is a subsidiary of the multi-national Ajegroup producing soft drinks with other subsidiaries located throughout the whole of Latin America including Ajeper (Peru), Ajecuador (Ecuador), Ajamaya (Guatemala) and Ajacen (Costa Rica). Ajegroup’s head offices are based in Peru. Ajegroup’s market share is growing rapidly compared to its two largest competitors, Coca Cola and Pepsi. In contrast to its competitors, the company’s strategy focuses more heavily on attaining maximum distribution intensity and strong distribution channels rather than product promotion. In addition, the company sells its products at a significantly lower price than the competition. This price advantage is generally as much as 20 or 25%. Mexico is the second largest market for cola drinks after the USA, which makes Ajemex the largest of the Ajegroup subsidiaries. Ajemex has several production facilities in Mexico, the most important of which is located in Puebla and other factories in Villahermosa, Tabasco, Monterrey and Nuevo Leon. There are also eight distribution centres spread throughout Mexico. From these various distribution centres, bottled drinks are shipped on large 1020 x 1220 mm pallets in 48 and 53 ft containers. Every month, approximately 80,000 pallets are transported.A means had been sought for some time to reduce costs. One of the largest costs within the production units are the pallets. Doing away with pallets in exchange for special-purpose push-pull equipment is expensive, maintenance-intensive and requires heavier-duty forklift trucks. The use of hydraulic systems is also avoided at all costs in the food industry because of possible leakages. If only Ajemex could do away with its pallets, then the company would be able to save millions of US dollars. Paperboard Products de México (PPM), Meijer Handling Solutions’ Mexican dealer, had been in touch with Ajemex for some time. Ajemex was already a customer having purchased single and double pallet handlers, as well as other equipment for its forklift trucks. At the end of 2007, PPM introduced the unique RollerForks concept to Ajemex to load and unload without pallets as a possible cost-cutting measure. Cost savings are of major importance within Ajegroup, and especially Ajemex, as the company competes principally on product pricing. Since then, PPM specialists have made several trips to the Puebla factory to conduct tests and optimize the working environment. One of the problems that PPM encountered at Ajemex during RollerFork and Push-Pull testing was the possibility of damage being caused when using solid plastic or fibre slipsheets. In both instances, the nose or loading surface could potentially damage the PET bottles. PPM realized that Ajemex needed a sturdy yet cheap slipsheet. A solution was found in the form of a RollerFork pallet made of a honeycomb material. Following several tests, it was determined that a ½” honeycomb pallet was ideal. It turned out that the combination of the RF Honeycomb pallet and RollerForks was exactly what the company had been looking for. The next challenge was to create a watertight surface in case a PET bottle leaked or split. This would have disastrous consequences, as it is not possible to handle loads if the pallet gets wet. 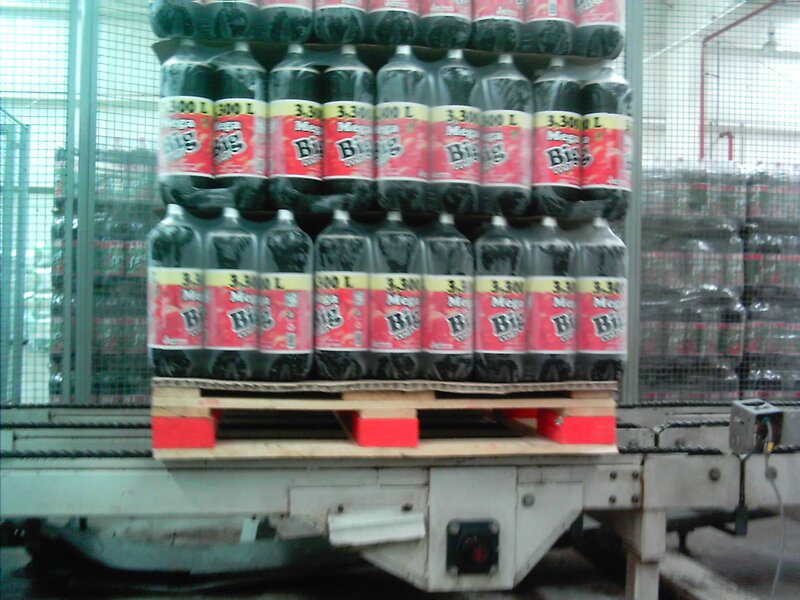 The solution involved applying a thin plastic layer to the top surface of the pallet. The final RF Honeycomb was completed by gluing eight ½” corrugated pads to each pallet and applying a special moisture protection sheet. The eight pads created an opening in which to insert the RollerForks allowing them to be rolled under the load more quickly and easily without damage to the PET bottles. It is also possible for customers to use RollerForks with these special RF Honeycomb pallets. Four sets of RollerForks are already in use at Ajemex now that all the logistic add-ons have been implemented, and an order for an additional two sets has already been placed. RollerForks are currently only being used within the production facility to replace manual loading and unloading of containers. In all probability, use of RollerForks and Honeycomb pallets will save Ajemex approximately $4 million. Ajemex expects that their method of working will also inspire their customers to make the transition to RollerForks.